"In Orsenna's witty rumination on words and grammar, 10-year-old Jeanne and her 14-year-old brother, Thomas, are shipwrecked on a strange island where words have become independent. Rendered mute, the siblings visit the Word Market, where one can buy the perfect word for any occasion. They also travel to a town full of independent words that strut around without the need for human beings to utter them. Such word adventures help restore the siblings' power of speech." Erik Orsenna is possibly one of the world's few remaining polymaths. He is not only a graduate of the London School of Economics (with a degree in politics, philosophy and economics), but also wrote a book to rival Nick Hornby's 31 Songs (in the form of History of the World in Nine Guitars, with Thierry Arnoult), and is known for writing books with titles that professional pedants die for (as well as Grammar is a Gentle, Sweet Song, he has also written the as-yet-untranslated Les chevaliers du subjonctif). 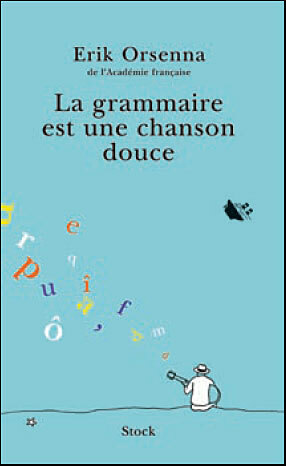 Further to this, there's another reason why his books should be more widely known to adults: the editions of La grammaire... published by the French publisher, Stock, contain sublime illustrations, which are also by the author. Adults sometimes like pictures in their books, too (even if they don't want to admit it). Happily, the Saint-Exupery-style illustrations are not the only positive aspect of La grammaire.... Orsenna is skilful in his use of child characters, putting him on a par with the more well-known Jostein Gaarder (particularly in relation to Gaarder's Hello? Is There Anybody There?) and with the work that made Antoine de Saint-Exupery so stratospherically famous, Le Petit Prince. Other similarities to these books include Orsenna's fantasy-soaked setting and imaginative style, so it is understandably pleasing to have this Saint-Exupery link confirmed towards the end of the novella, even if the author isn't necessarily someone whose work Orsenna desires to emulate directly. Orsenna is also wonderfully expressive and didactic, particularly in one passage where he compares constructing a phrase to decorating a Christmas tree: "You start with the naked tree, and then you decorate it to your whims and desires...Pay attention to your phrase: if you burden it with too many garlands and baubles - that is to say adjectives, adverbs and the like - it can collapse too." Whether Orsenna is deliberately didactic is difficult to say, but either way, he is not irritating in this, and he is successful. Overall, the story is well-constructed, its ending is satisfying, and its two main characters, Jeanne and Thomas, are as well-drawn as the other characters that they meet along the way. This is an enchanting hook into Orsenna's work, and, with its cleverness and wit, proves enjoyable for children and for grammar buffs alike. *noted here are only the works that have been translated into English; a wider selection is available in French.